Beginning in 2017, Drop It And Drive® (DIAD) began operating under the auspices of the Traffic Injury Research Foundation (TIRF) as a TIRF educational program. TIRF is an independent road safety research institute established in 1964 and is internationally recognized for its cutting-edge research, and delivery of objective, evidence-based knowledge to support the development, implementation, and evaluation of road safety programs, effective advocacy, and consultation. TIRF is a world leader in research, program and policy development, evaluation, and knowledge transfer with a primary focus on road user behaviours. Together, DIAD and TIRF blend evidence-based data and research produced by TIRF with the frontline program development and community engagement made available through DIAD. DIAD uses science and real stories to explain and demonstrate what behaviours increase risk and why, as well as share stories about the real consequences of these behaviours. This approach is designed to motivate behaviour change through personally relevant examples. 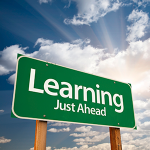 Our corporate seminars are customized to each client and their geographic location. We demonstrate easy-to-use tools to help managers and employees identify risk-related distractions in their workplace, and, share practical strategies for companies to implement distraction-related policies. Pre- and post-surveys are used to identify issues, trends and measure change. DIAD joint worker/supervisor seminars are typically 3.5 hours in length, including breaks. We also offer a variety of seminar formats and lengths to meet client needs, ranging from safety conference presentations to full-day comprehensive, hands-on seminars. Our focus for school seminars is to provide students with the science of ‘how and why’ distracted driving, and distracted walking, is risky behaviour. Taking a reality-based approach, we also discuss, through sharing personal stories, the real consequences of a moment’s distraction. At the end of each presentation we want students to feel empowered, through increased knowledge and understanding, to be road safety ambassadors within their families, school and community. What is the added value of DIAD? DIAD corporate clients are offered the opportunity to sponsor a free high school presentation in their community in conjunction with the corporate seminar. Clients are recognized for their sponsorship during the school presentation and also presented with a certificate of recognition. This helps create a community-based approach to road safety protecting the workforce, their younger family members and neighbours. 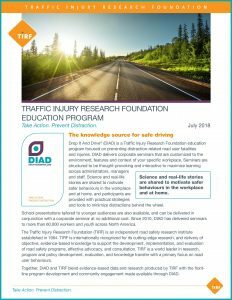 DIAD also provides access to the team of TIRF researchers who are knowledgeable about a broad range of road safety issues, and who can share the latest research findings and evidence-based programs and policies. The TIRF team has worked with practitioners across transportation, health and criminal justice systems throughout North America and around the world. Karen Bowman, Director, Drop It And Drive® Program: An international public speaker on road safety, Karen has developed an effective program delivery method to achieve behavioural change through imparting knowledge, science and practical, usable tools in a highly efficient and engaging manner. DIAD programs are well-known across multiple sectors and industries for their current content, community and workplace expertise, and practical implementation strategies to address distraction-related workplace risks from an occupational health and safety perspective. Karen actively tracks new knowledge and initiatives related to distracted driving through her network of contacts across several countries. Click here for a more comprehensive bio. 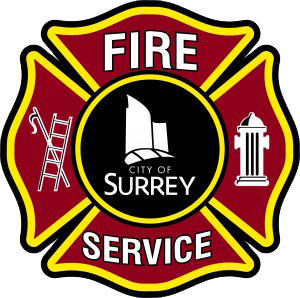 Captain Tim Baillie (Retired), Surrey Fire Services: During his 27 years as a fire fighter, Tim has attended more than a thousand motor vehicle collisions and has extensive rescue experience. Tim’s fire fighting career experiences bring an accurate and passionate perspective to this topic which helps create a reality-based learning experience. Tim’s background includes instructing at the Justice Institute of BC, OH&S Chair for the British Columbia Professional Fire Fighters (BCPFFA) for 10 years, Critical Incident Stress Management Peer Diffuser, BC Federation of Labour OH&S representative for 12 years, and BCPFFA Vice-President Emeritus. Inspector Mark Andrews, Ontario Provincial Police (Retired): Mark is a 32-year veteran of the Ontario Provincial Police with 14 years as the Traffic Manager for the North East Region as Commander, Traffic and Marine (491,000 sq. kms). In this role, Mark managed six specialty traffic teams, 13 Detachment Traffic and Marine Operations, Commercial Motor Vehicle Enforcement Unit, Snowmobile, All Terrain and Vehicle Enforcement Unit (SAVE), Technical Traffic Collision Investigation (TTCI)/Reconstruction Program and Collision Design Through Environmental Assessment. Mark currently delivers a Communications in Criminal Justice Course in 2016 at a Communications in Criminal Justice Course at Nipissing University, and remains active with the Ontario Injury Prevention Practitioners Network. Sergeant Bryan Fedirchuk, North Vancouver RCMP Traffic Services: Sgt Fedirchuk has over 22 years with the RCMP, 21 of which he has spent in traffic enforcement and investigation. He has 10 years experience as a collision analyst and has been a motor officer for over 20 years with the last 15 years as an instructor. Sgt Fedirchuk has investigated thousands of collisions; this extensive experience gives him insights into this issue that are unique and invaluable in providing a clear understanding of the mechanics and physics of traffic safety. Sgt Fedirchuk continues to be an active RCMP instructor in several traffic related fields, providing direction and insight to all levels of policing as requested. Past speaker – Sergeant Bob Nordlund (Retired): 35-year veteran with the RCMP. Bob retired in 2011 after spending 26 plus years in traffic law enforcement and collision investigation. He worked traffic on both major freeways in the Lower Mainland plus traffic in the cities of Surrey and Burnaby. Bob has investigated thousands of crashes in his career and brings his personal thoughts and feelings about causes of crashes to the presentations.